Your Christmas tree leads many lives. First, trees are grown from seedlings in one of almost 15,000 tree farms located in just about every state in the U.S. Trees take at least 10 years to grow before they are harvested. Once they are harvested, their next stop is a local Christmas tree lot for sale. Families take the trees home where they are adorned with ornaments and are the centerpiece of holiday celebrations. After the holidays, decorations are removed and it's time for the trees' next phase: recycling. 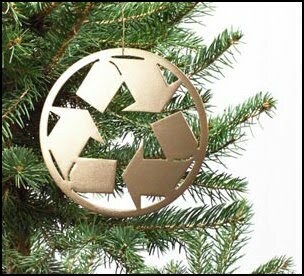 Christmas tree recycling programs are available in more than 4,000 communities in the United States. When you recycle a Christmas tree, the tree is chopped and turned into mulch that is then used by farmers, landscapers and backyard gardeners. Using mulch in landscapes naturally cuts down on weeds and erosion and reduces the need for water. Without recycling, the trees would be dumped into landfills. --cut the tree in half and put it in your green recycling container at curbside within two weeks after Christmas--or take the tree to your local green recycling center. Contact your local waste hauler for any specific instructions or options. One last note, if you're considering buying an artificial tree this year: more than 85 percent of artificial trees are made and shipped from China. Most contain non biodegradable plastic and metal. If you want to be "green" during the holidays, your best bet is to get a real tree. Kids at Garden Park Elementary School Say Thanks!